Press Release (ePRNews.com) - Southfield, MI - Jan 03, 2017 - ​​​​​Bluewater Technologies Group, Inc. is pleased to announce the opening of its sixth facility. In order to accommodate the continued growth and forecast of new employees required to support increased demand, Bluewater has moved part of its audio visual integration operations to a newly renovated 26,000 sq. ft. space in Farmington Hills, Michigan. This move will support Bluewater’s on-going growth plans. We have created an environment that reflects our culture and supports us as a destination where employees love coming to work every day. The move provides current employees an exciting new work environment that they will be eager to come to every day. Additionally, it will allow Bluewater to continue expanding and creating new jobs. This site features an open floor plan, huddle rooms, and unique personal spaces. We have created an environment that reflects our culture and supports us as a destination where employees love coming to work every day. Local Detroit artist Antonio “Shades” Agee was commissioned to provide interpretive graffiti, drawing out Bluewater’s unique personality. This work represents the organization’s personality and how it envisions the exceptional experiences found at the intersection of technology and creativity. 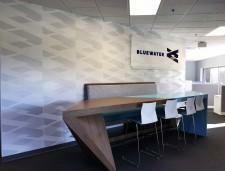 ​Shades has provided other signature work for Bluewater in other facilities. A ribbon cutting ceremony has been scheduled for January 26, 2017, at 1 p.m. For inquiries on attending contact Bluewater marketing at hello@bluewatertech.com. Bluewater works with agencies, producers, exhibit houses, architects, and consultants to create moving live event and AV technology experiences for strong brands. Founded in 1985 in Southfield, MI as a rental shop, Bluewater now operates four distinct business units: Meeting & Event Technology, Audio Visual Integration, Experiential, and Fixtures & Displays. All of our employees work toward a commitment to deliver flawlessly on every project we engage. To learn more visit www.bluewatertech.com or contact us at hello@bluewatertech.com. Source : Bluewater Technologies Group, Inc.